So You Want to Launch a New Institutional Website? Read this first! I hear these requests far too often from arts marketers. I don’t blame them for wanting something fast and inexpensive, but these timelines and budgets are incredibly unrealistic and create a domino effect that causes more work, lots of headaches, and ultimately leads to poor websites that keep our industry in the dark ages. A website is your most prominent marketing channel and is likely to be the first place a new patron will learn about your organization. For most organizations, more than half of ticket sales come from their website. And most organizations feel like they don’t have adequate budgets for their websites. It does not make sense to reach out to a web design/development firm until you have your ducks in a row. To continue Tom’s metaphor, don’t hire a general contractor before you hire an architect to draft blueprints. This often means adding at least three months to your timeline before you kickoff your redesign project with a design/development vendor. Remember, it’s a building, not a brochure. Those extra months will make a taxing project run much smoother and you will have a much better website in the long run. Your internal stakeholders will be more informed and you will be using research and data to craft your needs. It will allow your vendors to understand your expectations and allow them to provide a more accurate quote. 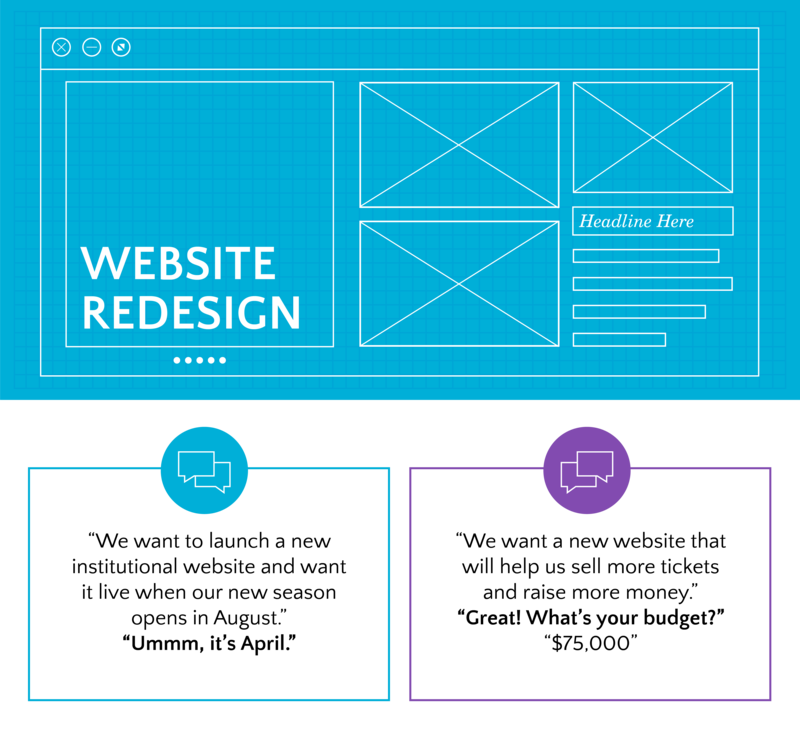 Two words you want to minimize during a redesign are “change order” which can blow up your budget and expand your timeline. This is a big decision and many organizations don’t realize what is at stake here. This project is going to be a significant portion of someone’s job—even a full time job. If you elect an internal project manager, you will need to find someone else (or a few others) to take on that person’s full-time responsibilities during the project. Another option is to hire an external project manager. Keep in mind that this comes with the challenge of getting that person up-to-speed and it still requires participation from an internal project lead. Choosing a project manager is one of the most significant parts of this process. Website projects are equal parts psychology and technology. A good project manager has to manage many competing interests and personalities across departments. Choose very carefully. 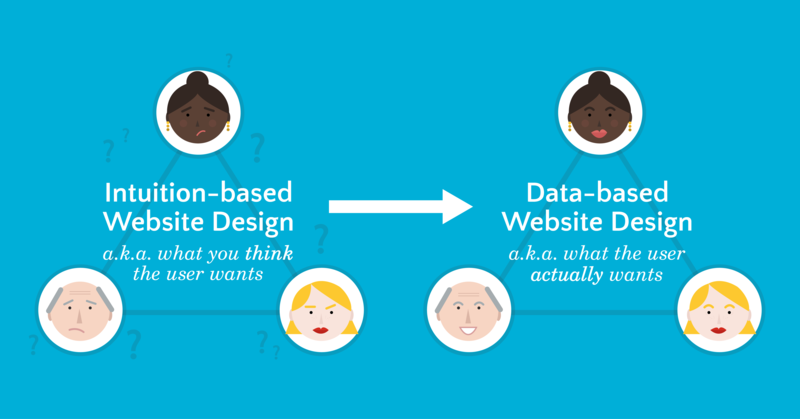 Many organizations base their website on intuition, not data. They often mirror the company’s internal organizational chart rather than user needs. Marketing content lives under “Shows and Events.” Development content exists under “Support.” Education content is under “Education” etc. Sound familiar? Users do not see your site that way and often miss important data. From client research we know that most users come to an arts website to learn about one particular show or event. They rarely make it to education or development pages. The key is putting important information where the users are—and that typically is on the event detail pages. If your Google Analytics setup is properly implemented, you can use data to understand the user journey through your site. 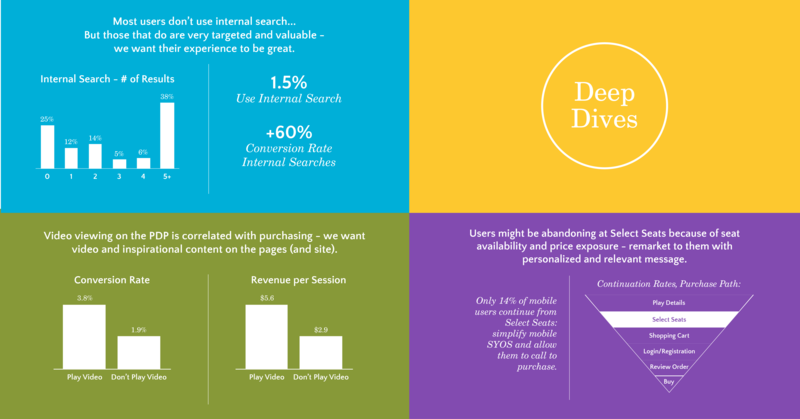 You can also see where users have challenges and leave your site, and which elements are valuable to increasing purchase conversions. I once sat through a meeting where a team of administrators outlined event detail pages for their new site based on a vote of what they felt was most important. Show description on top, followed by social sharing tools, followed by cast bios, then on the bottom they decided to place videos and slideshows from the show. The site launched and after some Google Analytics analysis, we learned that when people viewed a slideshow, they were 12% more likely to purchase a ticket! But a significant portion of users never saw the slideshow because it was relegated to the bottom of the page. See the problem with using intuition rather than data? So the first thing you should do is make sure you have a proper Google Analytics implementation. And once you do (and have enough data to analyze) you should conduct what we call a “deep dive” of your data to suss out user behaviors and trends. This will be key when you’re outlining your new site layout. Create your list of primary stakeholders. This will include a representative from each department who will collaborate regularly with the project manager. Their first job is to help set up internal discovery meetings with their department and the project manager. This information will be used to help create the Request for Proposal (RFP). During these internal discovery meetings, everyone can voice their challenges with the current site and outline hopes and dreams for the future site. It is imperative to let everyone know that this is a brainstorming phase and ultimately you will be constrained by time and budget. But this is the time to get those dreams on the table. Throughout the site redesign process, these stakeholders will meet regularly with the project manager to make critical decisions. Now that you have quantitative data showing what is and isn’t working on your site, the wish list for your future site, and your user personas, you can begin crafting your Request for Proposal (RFP) to send to prospective vendors. Company Overview – Tell them about your company and your market. Timeline and Budget – Outline your budget so you don’t waste anyone’s time. Pro-tip: Only list 85% of what you really have because you will want that additional budget in your back pocket for later. Project Scope – What exactly are you asking for? Just a frontend redesign? A new CMS? Email templates? A phased approach? Goals and Objectives – What Key Performance Indicators (KPIs) are you using to measure the success of this project? Increase in conversion rates? Increase in visits to the devo pages? Current Site Overview & Desired Improvements – What is wrong and how do you want to fix it? Here is where you can list your grievances with your current site, but keep this short and sweet. Focus on the future not the past. 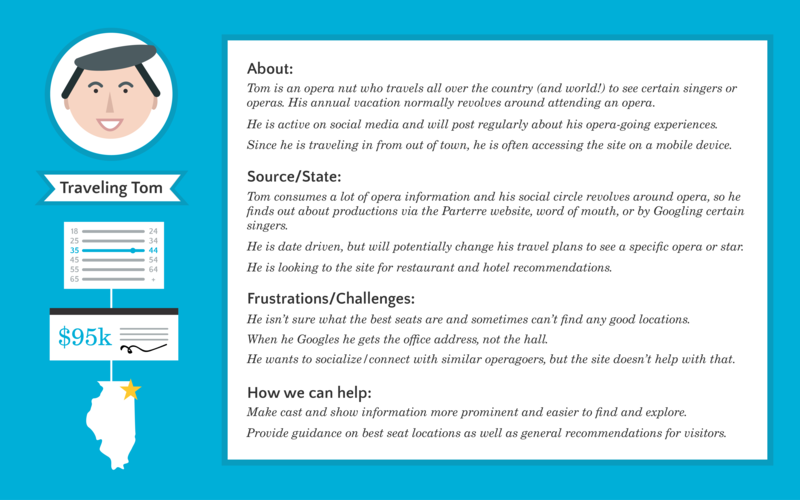 User Overview: Personas & Analytics – This is where your personas and Google Analytics work comes in (outlined above). Functional Requirements – What should each part of the site do? This is where the work from your stakeholder interviews comes in. Example Websites – What sites do you admire both within the arts world and outside of it? These can be full sites or just sections or features of certain sites. Measures of Success – What is going to make this project successful? No change orders? Daily communication with the vendor? A happy board? Vendor Information Request – What do you want from the vendor and when do you need it? We typically give 3-4 weeks for a vendor to craft their proposals. Research the vendors you will eventually send your RFP to. I recommend sending to at least four since one will most likely not be able to respond because they are too busy or your budget is too small. Give them a heads-up that an RFP will be coming their way so they are ready to respond on your timeline. And make sure you allot time to have individual calls with each of the vendors. A good vendor is going to ask questions so they can prepare an accurate proposal for you. You will need to create a protocol for evaluating the proposals once you receive them. We use a pretty detailed Excel document that has a weighted ranking based on what we are looking for. Outline what is most important and make that weight the heaviest. Then rank each proposal along with each weighted criterion. This should result in a score for each vendor. The vendors with the top scores should then get invited to give a pitch to the key stakeholders. Once you’ve selected the vendor, you will get some very intense paperwork from them. I’ve seen many organizations slip up here. Take the time to fully understand what they are proposing in the scope of work and seek outside help if you need it. Some key questions to ask: Is the vendor providing you a fully launched site or just a block of hours? What is the change order process? Who owns the code? Who is responsible for content creation and what help will the vendor provide with content? What happens if there are major delays in launching? Who is paying for vendor travel? What are the client responsibilities for getting the site to a live environment? How often will you have meetings? I could go on and on. This part takes time, so you must include at least two weeks on your timeline to review and settle this. I’ve been on website projects that launch on time and on budget with no drama. Really! And I have been privy to nightmares. Bottom line: you have to be incredibly clear about your expectations and be prepared internally to take on these projects from a budgetary and human resources perspective. They will dominate people’s time for the good part of a year. Do not take this lightly. Good luck! For more on this topic, I recommend reading Kristina Murti’s post about her experience redesigning the Seattle Opera site. Side note: Just for clarity, we do not design or develop websites at Capacity. We can provide expertise as digital marketers and strategists. We can help you create a project timeline and budget, configure your web analytics, analyze user behavior, create personas, craft your RFP etc. and/or just hold your hand through the process. Need help?